Working with many warehouse managers in the small and mid-size market segment makes it clear that one of the biggest challenges managers face is effectively and efficiently running warehouse operations. It’s not surprising to see warehouse problems arise as founders and decision makers are more focused on trying to keep their businesses profitable in a very competitive marketplace. As a result, they are left with little time to put in place an efficient, error free, and safe warehouse operation. In this article we’ll review 5 pillars that warehouse managers must put in place to ensure operational success. The extent to which these pillars are implemented depends on the size of the warehouse, but they must exist at least to some degree. Let’s review each of them in detail. The warehouse is a part of a bigger picture: the supply chain. As a result, for a warehouse to be successful it must fulfill its role of receiving, storing, and shipping goods to the right customer in the right quantities at the right time. With the increasing pressure to move goods quicker at the lowest possible cost, it’s not surprising to see accuracy being affected - cargo being shipped to the wrong customers or in the wrong quantities or at the wrong time - especially among small and mid-size warehousing operations. Luckily technology is catching up with these needs and becoming more affordable. Solutions like barcode scanners, warehouse management systems, and RFIDs are helping warehouse operations increase their accuracy. But technology alone can’t fix it all. Well documented processes along with checks & balances and employee training are pivotal to increasing and maintaining accuracy in the warehouse. We discussed that the role of the warehouse in the supply chain is to receive, store, and ship goods to the right customer in the right quantities at the right time. And now we’re adding that those goods also need to be stored and shipped at right price. For this to happen, warehouse managers need to keep an eye on operating costs. With that being said, it’s not surprising that in 2015, research conducted on behalf of Modern Materials Handling showed 83% of warehouse managers are focused on lowering their operating costs. Storage Costs: The cost associated with buying or renting a warehouse to store goods is at the top of the list. The cost per square foot per year in the US can range from as low as $2.64 SF/Year and as high as $11.16 SF/Year depending on location. Labor Costs: Labor related costs are the second highest operating cost within the warehouse. Labor cost are related to the job role, skill set, and location (city/state). As per the U.S. Bureau of Labor Statistics the median pay of a warehouse clerk is $24,090 per year/$11.58 per hour. In addition to storage and labor, two other costs that also figure on top of the list include equipment and utility costs. In a later article we will discuss strategies to control costs within the warehouse and increase return on investment. Now that we’ve talked about warehouse operating costs it’s time to discuss warehouse efficiency. Cost inefficiency within a warehouse is probably one of the most difficult to detect and correct in a warehouse operation. At the core of running an efficient warehouse lies technology and processes. Technology: Warehouse technology provides ways to automate repetitive tasks, improve the management of resources (warehouse space utilization, labor, equipment, etc.) and consistently and reliably collect data to forecast demand, improve processes, and make well informed decisions. 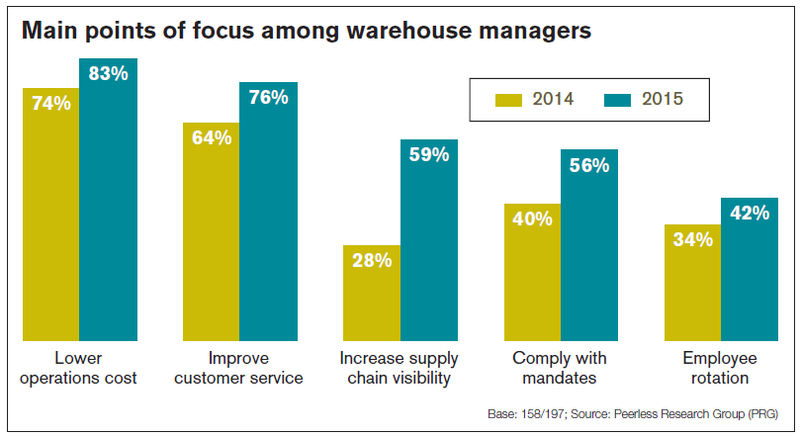 Processes: This is the point that warehouse optimization becomes pivotal. Research shows over and over again that warehouses that properly define, document, review and optimize their processes at least once a year are more efficient than their counter parts. Not every cargo requires the same process and no one process fits all. 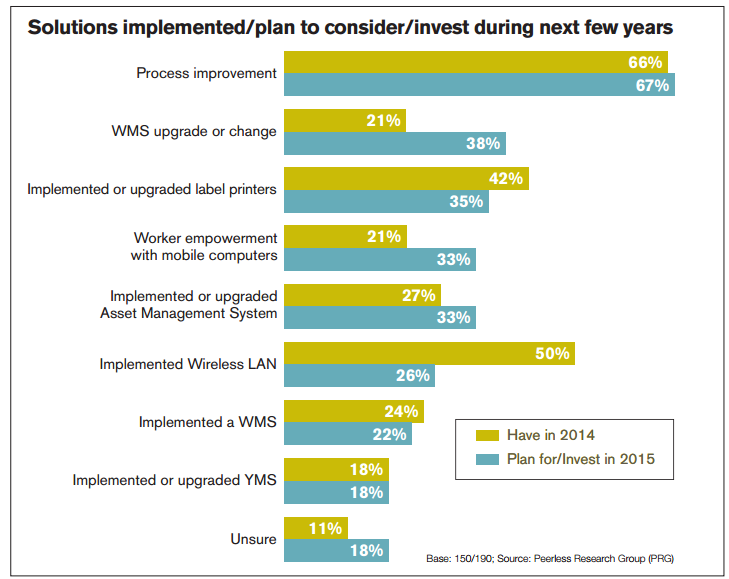 Modern Materials Handling research shows that warehouse process improvement is at the top of warehouse managers lists and the place where they plan to invest over the next few years. Customers have entrusted your business with their goods and/or your company has invested substantial capital in goods to sell, make profit on, and keep the business going. As a result, the security of these goods is paramount to retain customers, gain repeat business, maintain a good reputation in the industry, and run a profitable business. To lend some perspective on the importance of warehouse security, warehouses are one of the links across the supply chain with the highest theft rate due to the high concentration of goods in a single location. To make things worse, research suggests that more than half of warehouse theft involves internal resources, directly and indirectly. Warehouse health and safety, a topic often neglected by smaller warehouses is one of the most important aspects of successful warehouse management. Regardless of the size of the warehouse one thing is certain, accidents will happen. The fatal injury rate for the warehousing industry is higher than the national average for all industries. So, increasing the safety within the warehouse is not only the right thing to do, but also the smart thing to do. You will either incur expenses now to prevent an accident or later to defend your business in court. The right and smart thing to do is to be proactive and provide a secure and safe workplace within the warehouse. So now we’ve lain down 5 fundamentals for successful & profitable warehouse management. Although it can be overwhelming to put all these pillars, processes, and procedures in place I can assure you that it’s not impossible – many have done it already. Start by laying out a vision, defining priorities, and breaking steps in very small tasks that can be achieved. This way, people will feel that they’re succeeding in achieving the vision and this will boost morale and productivity in the warehouse. Think Big, Start Small & Deliver Quickly!